Another fantastic cover by Jerry Grandenetti. From 1954. Union troops are hoping to drive the Confederates out of the border state of Tennessee. To this end, a secret agent comes up with a bold plan to steal a train and use it to burn railway bridges along the Southern supply line. On April 12, 1862, this plan was put into action. This is the sixth of 17 episodes from various series that will take us through the Civil War and its immediate post-war legacy. I'll be posting another Civil War episode every three or four weeks. As the September dusk in San Antonio turned into a dark and shielding night, the stranger witht he arrow wound decided that it was time to make his escape from the doctor's house. That's an excellent opening sentence, isn't it?--designed to immediately draw you into the story. 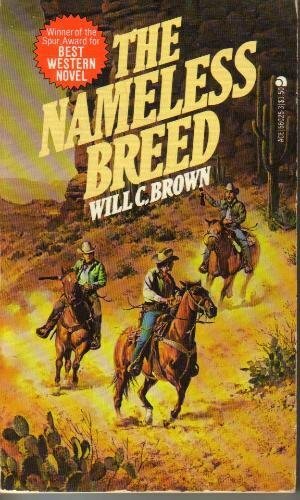 Will C. Brown's 1960 novel The Nameless Breed wins points from its setting alone. Placing the action in Texas in 1844 (when Texas was still an independent republic) immediately sets it apart from most Westerns. The new nation was struggling to remain independent, suffering incursions by Mexican soldiers, raids by Comanches, an economic depression, and pressures from other nations to either expand its territory and influence or simply allow itself to be annexed into the United States. The protagonist is Brazos McCloud, who has spend the last year trying to figure out how to free his father from the Comanches. Finding him and rescuing him doesn't seem possible, but there might be a chance of ransoming him if Brazos and his two brothers can raise enough cash. It's the fluid political situation that gives them an opportunity to get the money they need. A spy for England named Spide (appropriately nicknamed Spider both because of his appearance and his personality) wants to see some diplomatic papers that are being brought by courier from Washington. 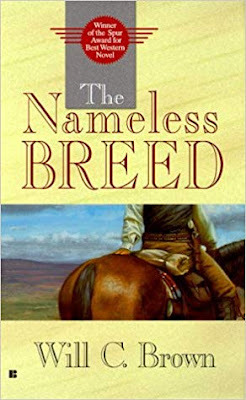 Brazos is normally a scrupulously honest man--we see several examples of this throughout the novel--but when the story opens, Brazos has already stolen these papers. The plan is to sell them to Spide, then head north to where the Comanches hang out, looking for a way to contact them and offer a ransom for his father. The McCloud family is vehementaly anti-annexation, so stealing from a Union agent as Step One is saving their dad is something they can live with. But things continually go wrong. Brazos is recovering from a Comanche arrow wound when the novel begins (from a random attack that didn't involve his mission), he gets seperated from the papers, and it is soon apparent that Spide (who isn't necessarily working for the English) is planning on double-crossing him. Brazos is a great protagonist. He has a strong sense of right and wrong that he will not compromise on even when the situation around him is terrible. The fact that he wants to honor his part of his deal with Spide after Spide has double-crossed him is evidence of that. He is courageous, loyal and able to keep his head under pressure. But he's not a one-dimensional hero--the author gives him a concrete and relatable personality. The supporting cast, both good guys and bad guys, are equally well-drawn. Brazos' older brother Wid, who rides north on the ransom mission with his brothers despite the pain and difficulty of doing so with a wooden leg, is a particularly strong character. The rest of the family doesn't want to go, but know they have to let him try for him to keep his manhood. As Wid's sister-in-law says: "Don't you see--it's the last act of a man, the way for him to prove to himself that he is still a whole man. The oldest of you doing what the oldest son ought to do! Better he goes and suffers in the going, on the trail, than stays and suffers inside himself, a prisoner to his deformity! I cry to myself when I think of him going, but I would not want to see him shrivel here day after day while the rest of you were riding north [to rescue their father]." The action sequences are exciting and suspenseful. 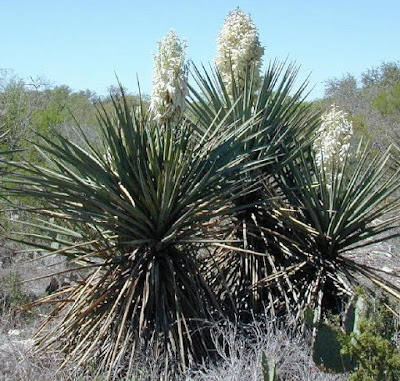 Most notable here is when Brazos and one other character have to flee from a gang of killers by crawling under a huge patch of Yucca Daggers (plants with sharp, bayonet-like leaves). Stand up and they will skewer themselves even if they aren't immediately shot. Continue to crawl and they cut themselves on sharp rocks and have to dodge rattlesnakes. The Nameless Breed won the Spur Award (given by the Western Writers of America) in 1960 and clearly deserves it. It works as both an excellent and exciting work of genre fiction and as a wonderful character study of a family in which each of them would risk anything for the others. When we left the Lord of the Jungle last week, we were about half-way through a magnificent story arc from the Sunday comic strip. 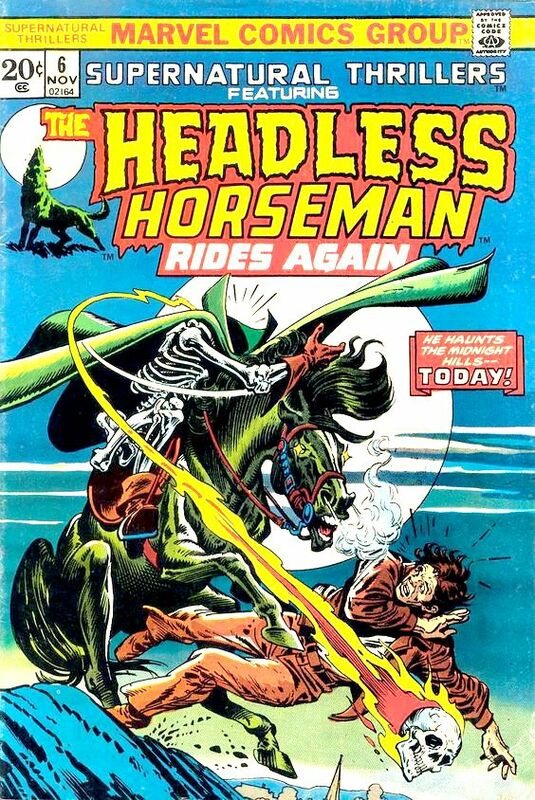 Written and drawn by Russ Manning, this arc ran from February 1971 through April 1972. Jane had escorted two women photographers to the outskirts of Pal-ul-don, the dinosaur-infested Lost World that exists somewhere in Africa. 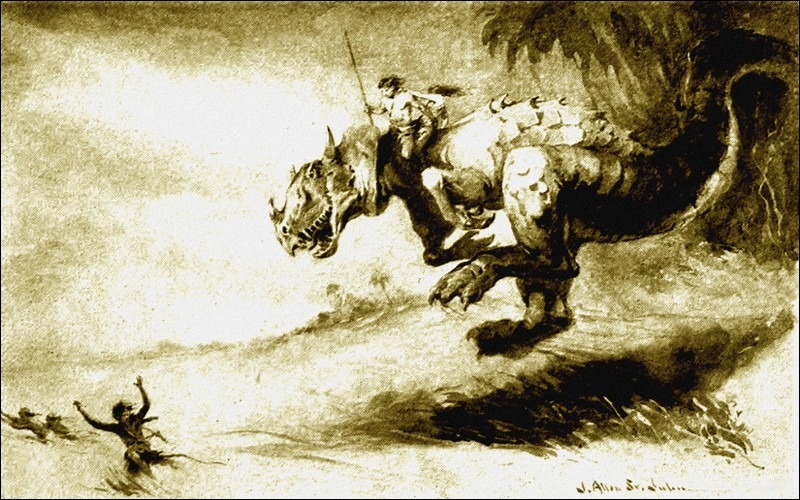 As is typical in any story set in Edgar Rice Burroughs' never-a-dull-moment universe, the women end up deep inside Pal-ul-don. Tarzan and Joiper (a tiny visitor from the valley of the Ant Men) enter Pal-ul-don to find and rescue the ladies. After a series of fast-paced adventures, Tarzan has rescued the lady photographers (Samie and Carli) but hasn't yet found Jane. What he has found is one of the Waz-don who inhabit Pal-ul-don getting pushed into a pack of hyeanodons by some of his fellow tribesmen. Tarzan rescues this guy, but he's forced to separate from the girls, who promptly get to themselves get kidnapped by the Waz-don. Trying to keep more than one of his friends un-kidnapped at any one time is sometimes a Sisyphean task for poor Lord Greystoke. Anyway, the Waz-don he rescued is the high priest at the Waz-don cliff city. The priest had somehow ticked off the chief and been given a death sentence. Tarzan ends up in the city and it soon involved in political shenanigans, which in turn leads him to fight (and win, of course) a duel that makes him chief. Uneasy lies the head that wears the crown. Pretty much the moment Tarzan takes over, the Ho-don (the light-furred natives who are perpetually fighting the Waz-don) attack. So Tarzan is soon in the midst of a battle involving soldiers mounted atop several different species of prehistoric beasts. 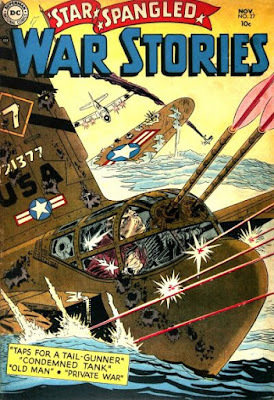 Manning's art work has never been better--the above panels represent the sort of image I can stare at pretty much forever in rapturous awe--and his story has not just been exciting, but also quite sophisticated as we are quickly introduced to new characters and complicated political situations. The exposition never slows up the story and we never lose track of what is going on. During the battle, Tarzan spots Jane apparently leading the Ho-don's in battle. But Jane does not acknowledge him when he calls out to her. She does, though, order the Ho-don forces to retreat. At this point, the action moves away from the Ape Man to let us know what has been going on with Jane all these months. In fact, Manning is going to emulate one of the Burroughs' most common storytelling techniques. He breaks away from Tarzan at the cliffhanger moment. He'll catch us up on Jane's story, then break away from her at a cliffhanger moment. Then he'll flash back to Tarzan, showing us what he has been up to since we last so him. Then he'll intersect these two stories at a key moment. Jane, by the way, is also up to her neck in complex political intrigue. I'm not going to try to summarize the details. The important point is that she's being blackmailed into pretending to be a sun goddess by an evil high priestess. When she attempts to get the upper hand over the priestess, she ends up getting tossed into an arena to be eaten by saber-tooth tigers. She looks a tad worried in the above panel, doesn't she? But for Jane, a situation like this is usually called "Tuesday." That's the point we break away from her story and return to Tarzan, recounted his adventure in sneaking into the Ho-don city and ending up in just the right place to launch a last minute rescue of his wife. For Tarzan, this sort of thing is also called "Tuesday." I'm pretty sure that if you look up the word "awesome" in the dictionary, it shows you the above panel as the definition. Jane, despite having a broken arm, gets her licks in on the priestess, then she and Tarzan escape from the city, finding a place to rest and heal from their respective wounds. Well, it turns out that Tarzan and Jane are destined for most adventures in Pal-ul-don before they get home. But Manning made his readers wait for that. The next five months of strips would focus on Tarzan's son Korak. The strip would return to Tarzan and Jane in September of 1972 and give us another full years' worth of adventure in Pal-ul-don. I won't promise when, but we'll take a look at those strips eventually. Next week, though, we'll return to the Wild West for the second of the four adventures featuring the Yankee Lee Hunter and the ex-Confederate Reb Stuart. A terrific Carl Barks cover from 1958. Miss Brooks gets roped into babysitting three children, which leads to her students believing she is secretly married to Mr. Boynton and raising a family of her own. Few actresses other than Eve Arden can deliver a line like "Go to your room or I'll kill you" to a child in a deadpan voice and make it funny rather than mean-spirited. 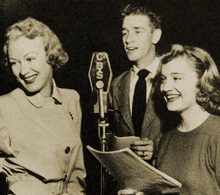 For more adventures in babysitting on old-time radio, read my article on the subject HERE. Brackett and Bradbury Team Up! Leigh Brackett--one of the finest writers of Space Opera who ever put pen to paper--was a little more than halfway through writing a story titled "Lorelei of the Red Mist" when an opportunity to write the screenplay for the classic Bogie film The Big Sleep dropped in her lap. So she handed the manuscript to Ray Bradbury and let him take the story wherever he wished. 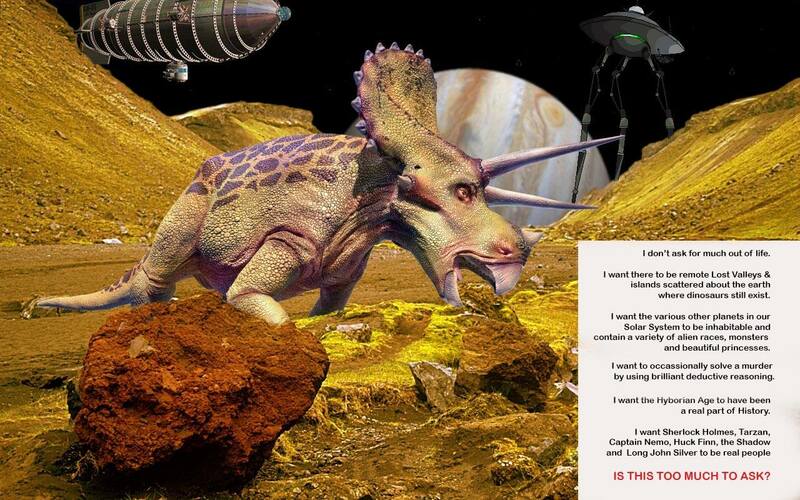 The result is one of the finest Space Opera yarns that ever appeared in Planet Stories. And that's saying a lot. By the way, in her introduction to the 1974 Anthology The Best of Planet Stories, Brackett mentions how many readers try to deduce which elements of the story were hers and which were Bradbury's. It's really very simple. Everything before the sentence "He saw the flock, herded by more of the golden hounds" is Brackett. Everything else from that time on is Bradbury's. The story starts out with a criminal named Hugh Starke, having just stolen a fortune from the Terro-Venus Mines, Inc., flying his ship over the Mountains of White Cloud on Venus, trying to dodge the company detectives. This doesn't work out very well for him. His ship crashes and he is fatally injured. But that's not the end of him. Starke's mind is transfered into another body by a beautiful Venusian sea-woman named Rann. This body used to belong to a warrior named Conan, but Conan's mind was broken by torture and now Starke has sort of moved in and taken over. 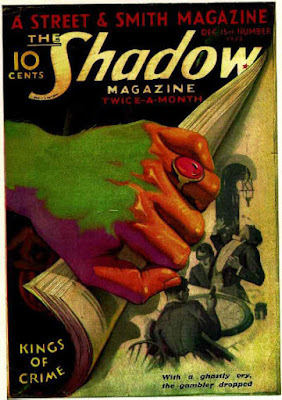 Brackett mentions in the Best of Planet Stories introduction that she named the protagonist's new body Conan as a tribute to Robert E. Howard, as she admired his work. But she later considered this to be a mistake, as her Conan and Howard's Conan are such different characters. Anyway, Hugh-Starke-as-Conan finds himself in a violent and complex political situation. A kingdom of land-people--who are native Venusians but essentially identical to humans--are being attacked by a faction of Venusian sea-people who left the sea a long time ago. Rann is the leader of these aggressors and she plans to use mind control tricks to force Starke to kill the leaders of the land-people. But there is another faction of sea-people who never left the sea and want to wipe out both land-based factions. Hugh has not lived a very notable life before being thrust into a new body, but now he finds himself forced into an heroic role. As much because he's stubborn as because he's never been a murderer, he manages to (mostly) resist Rann's mental commands. At first, his intent is to figure out a way to recover the money he had stolen and get back to human civilization, figuring that his new body means he's unlikely to ever get tracked down by the cops. But a rapidly growing conscience and a growing love for a warrior woman named Beudag will bring him to the decision to stay and help the land-people. To do this, though, he must convince that second faction of sea-people to alter their plans. That faction has been collecting the corpses of those killed in the ongoing war between the surface dwellers. They have a science that will allow them to re-animate the corpses for a short-time, using them to launch a genocidal attack. The prose styles of the two authors mesh together smoothly and Bradbury takes the story in a great direction, bringing it to a violent but satisfying conclusion. The plot is full of tension and the setting (especially a sequence set beneath an ocean formed by a strange, breathable radiation rather than water) is often pretty spooky, with the super science in the story effectively working like magic. In fact, the story often feels more like a sword-and-sorcery tale than a Space Opera. That's not a criticism, though, "Lorelei of the Red Mist" works fine just the way it is. The story has been anthologized a number of times and is also available to read online HERE. The land of Pal-ul-Don first appeared in Edgar Rice Burroughs' 1921 novel Tarzan the Terrible. Located in an almost inaccesible area of Africa, it ranks up there with ERB's best Lost Worlds--not just because it has dinosaurs in it, but also because of the sophisticated world-building Burroughs did in creating the world, which allowed him to craft one of his most engrossing and action-packed stories. As I've mentioned before, the writers of the Dell and Gold Key comics featuring Tarzan and Korak took the Greystokes back to Pal-ul-don on a number of occasions. The commercial value of this is obvious--an excuse for including dinosaurs on a comic book cover and in the story itself always helps a book stand out on the spinner rack. But it was also a good idea in terms of storytelling. Pal-ul-don is a rich world in which a lot of adventures can take place. Inevitably, other writers started adding to Pal-ul-don to open up yet more storytelling possibilities. The comic books added several purely human cultures to the mix. But I believe that it was Russ Manning's Sunday strip that added several very important additions and ideas to that world. One of my favorite story arcs from the Sunday strip ran from February 1971 to April 1972. It is a breathlessly fast-moving adventure--especially when read as reprints without a chance to catch your breath between entries. Manning adds several more items to the increasingly complex Pal-ul-don mix. In a story arc from the daily strips in 1969, he had introduced Wieroos--the brutal race of wingmen who normally lived in another of ERB's lost worlds--to Pal-ul-don. Actually, I should add a caveat to that. As far as I know, the first appearance of Wieroos in Pal-ul-don is in those 1969 strips. There may have been an earlier comic book or comic strip appearance that I'm not aware of. I checked with Jess Terrell, one of my co-hosts for the ERB podcast, but he wasn't sure either. Manning also introduces the idea that Pal-ul-don exists in a different time than the rest of the world--the paths that lead there literally take you back in time. For purely personal ideas, I don't care for this. As far as I'm concerned, Pal-ul-don, Caspak, Pellucidar, Skull Island, the Valley of Gwangi, Challenger's plateau, Dinosaur Island and the Savage Land all exist in the here-and-now and I'll be able to take a dinosaur-themed vacation one day. A world were this isn't true is simpy an intolerable idea. But we can look at the comic strips and comic books--excellent as they are--as an alternate continuity and, personal feelings aside, placing Pal-ul-don in a different space-time location is a perfectly viable idea. Let's dive into the story arc we are concerned today, Tarzan is recovering from wounds at a remote oasis. Jane, back home at the Greystoke African estate, is asked by two women photographers--Samie and Carli--to be a guide and take them to Pal-ul-don. Jane agrees, but only if they stop at the outskirts, take a few pictures of some Eohippus, then go home. That way, the journey should be safe enough. Nothing should go wrong. It is beyond me how anyone living in the Edgar Rice Burroughs universe would think this plan would work. Of course, things go wrong. Samie disappears and Carli thinks she sees Jane get scarfed down by a T-Rex before she flees back into the desert. Tarzan, meanwhile, has healed up and gotten home. An Ant Man warrior named Joiper lets Tarzan know where Jane has gotten off to. I have always enjoyed the way Manning weaves places and characters from various Tarzan novels into his stories. Joiper, who will accompany Tarzan to Pal-ul-don, is a great character. Though he has his own distinct personality, he reminds me quite a bit of Reepicheep from the Narnia novels--small but brave, noble and skilled with a sword. He's a tad more head-strong than Reep was, but there are a lot of parallels. What follows is a wonderful, non-stop action set-piece that runs for several months, with Tarzan, Joiper and Carli dodging dinosaurs; Tarzan using his tracking skills to determine Jane is alive; Carli getting captured by Wieroo and discovering that Sammie is already a prisoner in their city; then Tarzan and Joiper pulling off a daring rescue. Manning's kinetic and breathtaking art highlights the fast-paced writing, making this one of the most purely entertaining Tarzan stories I've ever read. When you consider Manning's beautiful art and his writing skills, he has probably done more than anyone else in portraying the real Burroughs feeling. They get out of the Weiroo city and back to the surface of Pal-ul-don, with Tarzan determined to stick around until he finds Jane. The August 22, 1971 strip ends with them all encountering a group of natives shoving someone off a cliff into a pack of carnivores. The story shifts gears somewhat at this point, with Tarzan getting involved in a civil war. So we'll pause here and finish up the story next week. 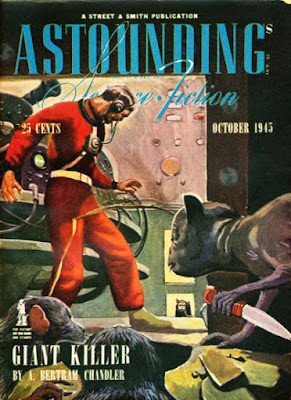 From 1945: A wonderful cover painted by William Timmins. 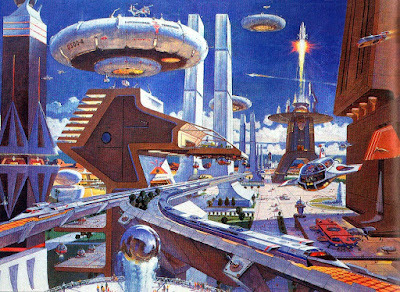 In the future, everyone is assigned a category according to the work they do. When a man is replaced at his job by a robot, he has to find a new job and thus be entered into another category. This will take time and training, because it's not as if he can just make up a new category and get paid for doing a non-existent job. The universe in which B-movie westerns exist is place where reality gets altered quite often. Sometimes, as in the case of the Three Mesquiteers films, the time frame in which the characters exist changes from one movie to the next. 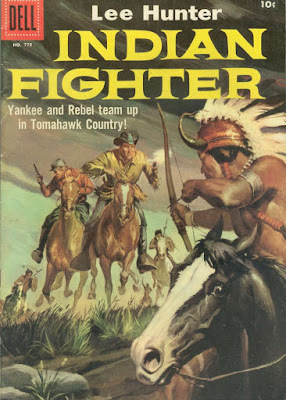 Sometimes, as in the case of the Tim Holt films, the protagonist might keep the same sidekick and the same horse from one movie to the next, but his name will inexplicably change. 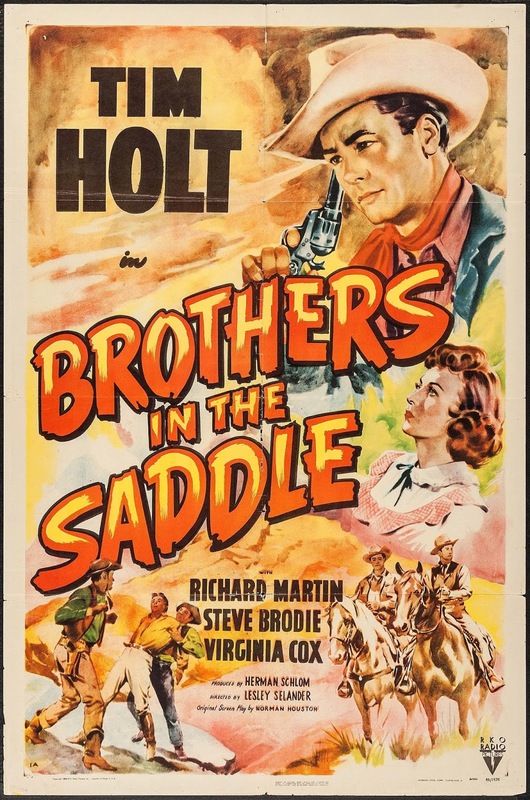 Take Brothers in the Saddle (1949), for instance. In this one, Tim Holt plays Tim Taylor. But in the films made the previous year, he was alternately Ross Daggert, Bob Banning, Dave Taylor and Tim Holt. This is despite the fact that he had the exact same sidekick in every film (Irish Mexican Chito Rafferty--played by Richard Martin) and the same horse (a palomino named Lightning). Why does Tim's name change every movie, while his sidekicks stay the same people? Why, O, Why? Oh, well. Whatever Holt's name may be this time out, Brothers in the Saddle is a great movie. Tim and Chito are working on the ranch of Nancy Austin (Virginia Cox). Tim's brother Steve (Steve Brodie) also works on the ranch, but is also now engaged to Nancy. This isn't necessarily a good thing for Nancy. Steve is a compulsive gambler and keeps dropping hundreds of dollars of Nancy's money in poker games. The guy can't win. Of course, it doesn't help that he keeps trying to win against crooked card sharps. Steve ends up killing one of the card sharps. It is self-defense, but when the saloon girl who can clear him runs off to Mexico, Steve is sentenced to hang. Tim sticks up for his brother, breaking him out of jail and then searching for the girl. He knows Steve has problems, but he believes Steve is innocent. Steve, though, doesn't stay innocent. While Tim is looking for the witness that can clear him, he decides to rob a stage. Then he decides to kill a man. Soon, Steve is wanted by the law for additional crimes, Nancy has tumbled to the fact that he's a bad guy and pretty much everyone--including his own brother--now acknowledges he's a rotten apple. Tim now has to bring in his own brother. How far will he go to do this? How far will Steve go to remain free? Directed by B-movie vet Lesley Selander, Brothers in the Saddle looks great, making effective use of location photography while telling a strong story that has a few unexpected twists. Tim's final confrontation against his brother is particularly good. But no one in the movie ever explains why Tim's name keeps changing. In the end, I guess we have to go with a "myths and legends" approach to his movies. That means each film is a different legendary story or tall tale about the same character. Tim's affable personality and strong moral sense, along with other consistent details such as sidekick and horse, create a mythic continuity from movie to movie, even if the details within each movie change. So it don't matter what Tim's name is. He's a mythic figure--a Western knight of the Round Table that gets talked about around campfires, with the tellers of these tales sometimes getting a few details wrong. Yeah, that sounds good. Let's go with that. 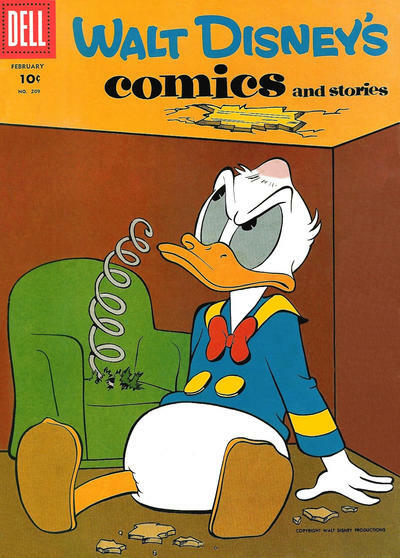 Dell Comics would often use their anthology book Four Color to try out new characters. Many times,these characters generated enough sales to spin off into their own books. Sometimes, though, good characters in strong stories simply didn't catch on and their one or two Four Color appearances were all they got before disappearing into Comic Book Limbo. Four Color #779 (March 1957) was the first of two issues featuring Lee Hunter, a former Yankee calvary officer and Reb Stuart, who fought in the Confederate calvary. After the war, the two men end up working together--Lee as a scout and Reb taking care of the horses--at Fort Defiance, deep in the heart of Indian territory. Despite the almost embarassing lack of originality in giving Reb a name, the premise was a good one, the stories (by an uncredited writer) are strong and the art (by Ray Bailey) is clean and effective. The two returned a little over a year later in another issue of Four Color, but apparently sales weren't strong enough to spin them off into their own series. But good characters should not be completely forgotten, so we'll look at their origin story today, then return every two or three weeks to examine the rest of their adventures. Lee and Reb meet at a waterhole while both are heading out West to for respective fresh starts. Reb is pretty open about his dislike for Yankees and the two men are soon trying to one-upmanship each other in a horse race. This is interrupted, though, when they run into Sioux wearing war paint. This leads to a very well-constructed action sequence that is both exciting and used to introduce us to important facets of both men. We learn that Lee knows the Indians--their customs and tactics--and Reb knows horses. Also, despite Reb being a bit of an arrogant jerk, he does save Lee's life. The sequence ends with the two men capturing a Sioux named Standing Bear, who is on the warpath because he wants to kill the chief of another tribe. That chief had killed Standing Bear's father. Since the commander at Fort Defiance is trying to get all the tribes together for a peace conference, this is a particularly dangerous situation. 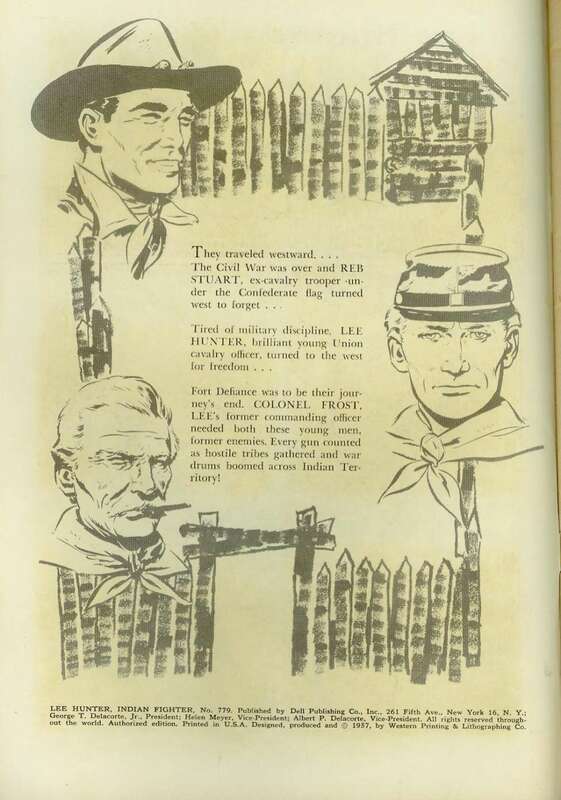 That commander, Colonel Frost, was Lee's commanding officer during the war. Lee doesn't want to re-up in the Calvary--he doesn't want to deal with the spit and polish any more--but he's happy to take a job as civilian scout. Reb hires on to take care of the horses. The bulk of the story involves efforts to keep the peace conference going despite Standing Bear's efforts at assassination. When an attempt by Lee to meet with the Sioux doesn't work out, Reb figures that a little "Southern Dash" is needed, but this just leads to getting himself captured. This, though, gives Lee an opportunity to save Reb and resolve the whole Standing Bear mess. The peace conference goes on and the story ends with Lee and Reb... well, actually it ends with them still disliking each other, but willing to work together. Reb's arrogance and non-stop bad temper is probably a little overdone and--after the story had taken pains to tell us he's an intelligent and capable person--getting himself captured was a moment of plot-driven stupidly that rings false. But despite these flaws, the story flows nicely. Lee and Reb fall into the "buddy cop" template that would eventually become a pop culture cliche. But the reason such things become cliches is because they are effective storytelling tropes when done well. Within two or three weeks, we'll see what Lee and Reb are doing to annoy each other in the second story from Four Color #779. Next week, though, we'll follow Tarzan and artist Russ Manning in a trip back to the dinosaur-infested land of Pal-ul-don. 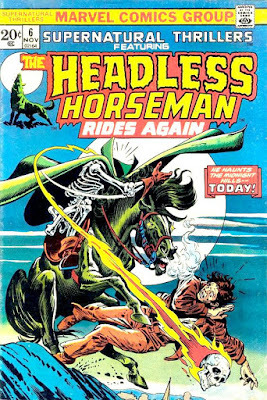 Another Gil Kane masterpiece--this one from 1973. The Union Navy is suddenly threatened by a Confederate ironclad. So a Union ironclad is rushed to Hampton Roads to meet this threat. 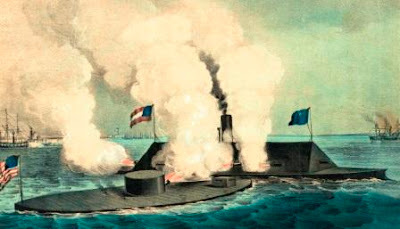 The battle between the two new-fangled warships took place on March 9, 1862. This is the fifth of 17 episodes from various series that will take us through the Civil War and its immediate post-war legacy. I'll be posting another Civil War episode every three or four weeks. The February 1949 issue of New Sports Magazine gets into the contact sports first. In the last "In Order" entry, we looked at the football story that batted lead-off in the magazine. Next, comes a boxing story by Johanas L. Bouma titled "No Count Kid." It's also the cover story for the issue. Like that football story, this one follows along arguably predictable lines, but is so well-told that we are happy to follow along anyways. Written in the first person, it's narrated by Mike Mariano, a former welter weight who is now a trainer. Mike ends up working with a young boxer named Joe Hearn. The tale is told in straightforward prose that grabs your interest right away: "The first time I saw this kid work was in Leon Abbit's gym in L.A. He was a welter a little tall for the weight, but lean in the flanks and with good shoulders. There was a heavy working with him, but the kid jabbed him so he didn't have a chance to get set." I know nothing about boxing in real life, so my vision of the behind-the-scenes stuff is shaped by fiction, since a lot of the old-time crime stories and Film Noir I enjoy uses the boxing world as a setting. So when I say that the author's succeeds in capturing the essence of the sport, I actually have no idea regarding what I'm talking about. But it feels right to me. Whether it is right doesn't matter. The world the story creates has solidity whether based on reality or fantasy. Joe Hearn has something of a chip on his shoulder. Fighting to prove himself after a rough childhood, he has a tendency to lose his temper in the ring. Mike realizes that if he can wean Joe off of this--teach him to fight more dispassionately--he could be a champ. And Mike has some success there. Joe does tame his temper and begins winning more bouts. This lasts right up until a girl gets involved in Joe's life. Women! Nothin' but trouble, I tell you! I'm making fun here, but all the characters are well-drawn and we come to care about them in a relatively short time. "No Count Kid" is another example of good, skillful storytelling. The next story in this issue is about the endlessly interesting game of... golf? Can a golf story actually be interesting? We'll find out next time. This issue of New Sports Magazine can be found online HERE. The B-movie detective (and his radio counterpart) called the Falcon had quite an active career solving crimes, so I have a meta reason for appreciating Marvel Premiere #49 (August 1979). The story, written by Mark Evanier and drawn by Sal Buscema, has Marvel Comics' hero the Falcon investigating a murder and using a clever bit of deductive reasoning to solve the crime. B-movie Falcon would have been proud. Sam Wilson doesn't normally play detective. After all, he can usually solve his cases by punching out whomever is wearing a garish costume and screaming "You'll never escape my death trap, fool!" It takes skill, but doesn't normally require Holmsian reasoning. He meets a guy Sigjid Roskoff, who has been giving fiery speeches about what he sees as hypocracy in American democracy and also trashing Captain America for solving problems by punching them. Falcon wants to jump to Cap's defense. And I'm kinda disappointed there was no room in the story for debate here. We are told that Roskoff is smart and well-reasoned, despite his fiery rhetoric. It would have been fun to hear a well-written point-counterpoint here. But a villain who calls himself the Silencer blasts his way into the room and carries off Roskoff, then murders him off-screen. The story's one weakpoint is here. 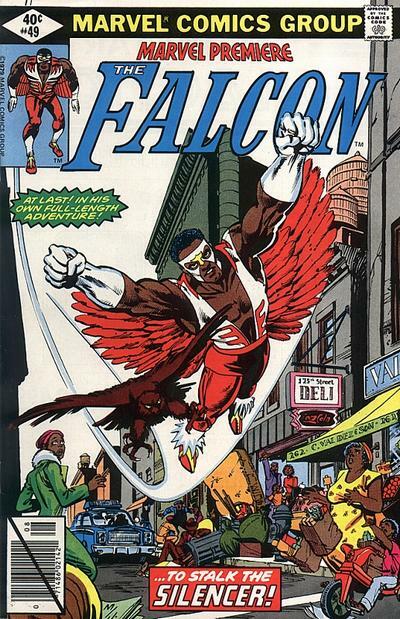 Falcon allows himself to be distracted so that the Silencer can sucker-punch him, but he's far too experienced by this point in his career to make that believable. The Silencer made Roskoff sign a note before being killed, allowing Roskoff to leave a dying clue: small dots under the letters O-T-T-F-F-S-S-E-N. But Falcon is at first stumped as to what this means. There's a hilarious sub-plot in which J. Jonah Jameson runs a contest to get his readers to solve this clue, which nets him answers such as "Oliver Twist Took Fannie Flag Snow Skiing Each Noon." The Silencer, by the way, is apparently a fanatic who is out to stop anyone making "UnAmerican" speeches. This is emphasized when the Falcon confronts him again attacking speech makers in Central Park. After a brief confrontation, the Silencer makes a getaway by forcing Falcon to deal with a live hand grenade. The case if abruptly solved when a guy named Count Barzon fills in for Roskoff to give a speech and simply guns the Silencer down when the villain attacks. The Silencer turns out to be some two-bit thug. It's at this point that Falcon has his Sherlock Holmes moment--O.T.T.F.F.S.S.E.N. = One Two Three Four Five Six Seven Eight Nine. 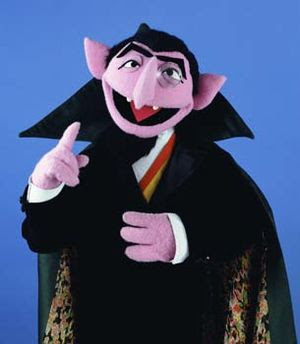 The killer is the Count! No, not that Count. The Count in the story, who created the Silencer to make it look like Roskoff's killer was a fanatic, then hired a two-bit thug to attack him later on. The thug, of course, didn't know he was going to get shot. Case solved. It's a fun story and works just fine as a murder mystery as well as a superhero story. Good action, a few dollops of humor and a fair play clue that points to the killer. Yes, the B-movie Falcon would indeed have been proud. That's it for this week. 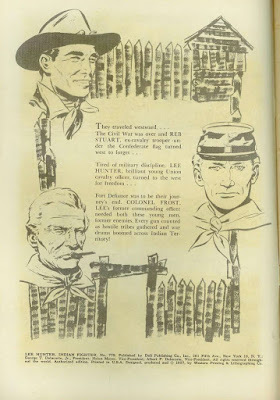 Next week will be a look at the first of four stories divided among two issues of Dell's Four Color, in which a former Yankee soldier and a former Reb have to work together in the post-war Wild West. 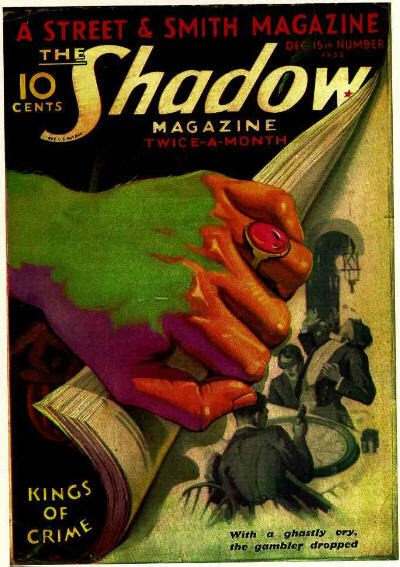 A Shadow cover from 1932 that can only be described as awesome.